I'm continually surprised by the number of students who tell me they would love to write a non-fiction book but don't know anything. They don't believe they know anything worth sharing in a book. When I hear this I tell them a story, which I am now going to share with you. Because I wanted to demonstrate how an author took a simple idea, a passion he had and turned it into a successful book. So a non-fiction book does not have to be about your hobby (although it could be), it doesn't have to be a cookbook (although it could be) and it doesn't have to be a self-help book (although it could be). It could be any subject you know something about and feel you could write about in a manner others will enjoy. So why not give it a go? Turn your passion into a book and share it with the world. Good stuff, Lynne. 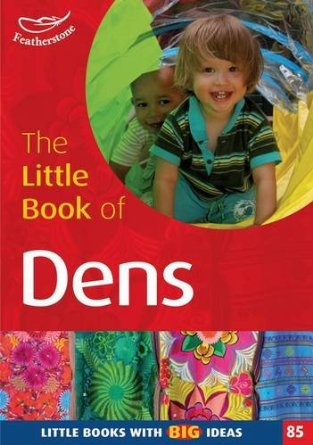 I love the idea of your book of dens - I LOVED dens as a child and had them in all sorts of places, indoors and out. Thanks, Lynne - this chimes beautifully with one or two other ideas I've had, and so I now have a theme for my next class - always good! Make a list of passions? That sounds like a good way to start the week. Well done with your "Dens." Alas, when you write for children, non fiction is not such a good idea unless, maybe, your name is Terry Deary! The kids love it but bookshops don't know what to do with it or where to put it. My last non fiction book sold every single copy, but only a few in bookshops, the rest through Scholastic Book Club where the kids can see what is on offer, but Book Club sales only pay a percentage of the net, so with a sold-out book I have never received a cent in royalties! The publisher has made it POD, but how many will that sell? You are talking of adult non fic, of course, which is a different matter. You never know what sells. People have long self published specific things for niche markets. That works. If you want a bestseller as in the story you tell above, you can only hope. There's no guarantee, though plenty of stories to keep everyone hoping. Some years ago, an old man called Bert Facey decided to write down his memoirs for his family. The result was a book called A Fortunate Life which was like a history of early twentieth century Australia, through the eyes of a young man who travelled around the outback for work, went to war, came home, married, lived through Australian history. It sold amazingly, became a play and a TV miniseries and is still available in ebook. And it was just meant to be for the family when he wrote it.